Teachers and students alike will revel in these fresh expressions of well-loved hymns and patriotic songs, written in one piano, four hand arrangements. 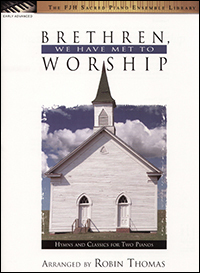 Contents include: Jesus Loves Me, in a classic "theme and variations" format, two hymns based on Psalm 23 combined in a style reminiscent of Chopin's Minute Waltz, a rousing patriotic medley which includes snatches of Sousa's The Stars and Stripes Forever, and a rollicking rendition of the gospel hymn, When the Roll Is Called up Yonder, arranged in a ragtime style. 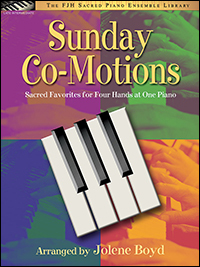 This volume of keyboard duets contains full arrangements of 7 favorite praise and worship songs interspersed among 11 new original pieces that are generally shorter in length. These arrangements are designed for maximum flexibility of usages from personalizing the length of a given song to the addition of a rhythm section if desired. 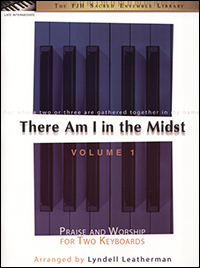 This collection of early advanced hymns and classics are arranged for two pianos, but may also be performed on a piano and synthesizer or two synthesizers. 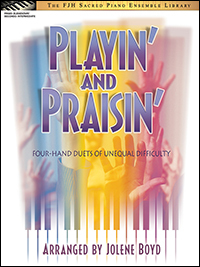 The inspiration for this collection comes from the arranger¹s desire to encourage instrumentalists to come together and share their faith and talents, and encourage congregations to praise God through music. 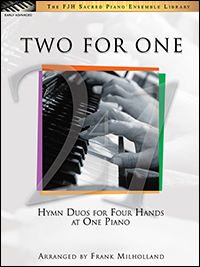 This piano duet collection (four hands at one piano) contains a variety of hymns arranged for accomplished church musicians, performers, or students. Selections include driving, rhythmic settings of At Calvary; The Lily of the Valley; and Joyful, Joyful, We Adore Thee; contrasted with the more sedate and serene arrangements of Beneath the Cross of Jesus; Be Thou My Vision; and Nearer, My God, to Thee. In addition, the volume includes a sparkling carol medley, Christmas Joy, which will be useful in myriad occasions–from church services to school Christmas programs to December recitals and concerts.